was a painter, sculptor, architect, scientist, inventor, writer and musician. He is recognized as a great scholar, although his projects, with some exceptions, have not been implemented. Recognized as a great painter and sculptor, although he wrote a lot of paintings and created only a few sculptures. Genius it is not the number of created works, and changing the methods of work in these branches of knowledge and art. About childhood and adolescence Leonardo almost did not survive any documents or memories. His father, Piero da Vinci, was a prominent notary of Florence. Mother Catherine was from the peasants. When she gave birth to a son (April 15, 1452), it is immediately married to a wealthy landowner, Piero del Vacca. The boy grew up in the house of his father and stepmother Albiera. On the formation of his personality was greatly influenced by his uncle Francesco. 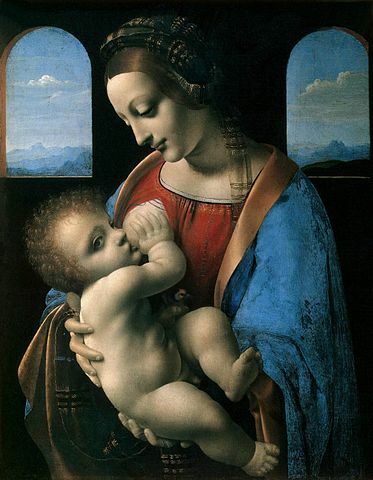 Leonardo was illegitimate and, according to the laws of the middle Ages, could not inherit the father"s profession. 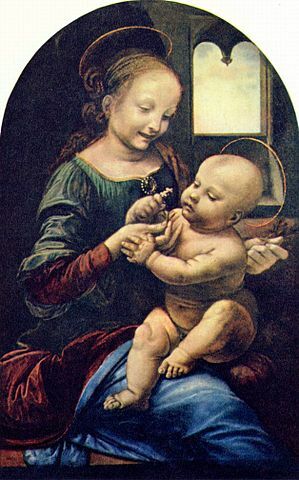 Piero was very familiar with Verrocchio at the meeting and showed him the drawings of his son. At age 14 Leonardo was apprenticed to the workshop of the famous painter. In the workshop of Verrocchio, the young man learned the basics of architecture, painting and sculpture, became acquainted with other branches of knowledge, made friends with the students, in particular, with Botticelli and Perugino. He met Toscanelli (mathematician and physician) and Leon Alberti. In the Guild of painters da Vinci, was adopted in 1472. The largest orders Verrocchio at this time was the statue" Давид" for the Medici family (presumably, the model was used da Vinci), and the painted dome of the Cathedral. eight years Later, Leonardo opened his own Studio. His first independent work is the image of an angel on the canvas" Крещение of Christ". 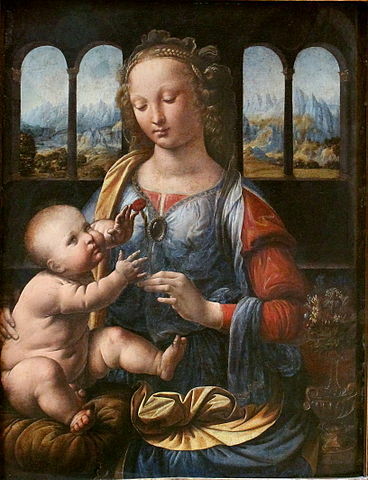 Vasari wrote that this work was created by Verrocchio. But spectral analysis, which was conducted by the staff of the Uffizi gallery, proof that this pattern worked 3-4 artist. A big part of the song — work of Botticelli. Leonardo painted the angel and landscape behind him. the Artist always signed his works, making them difficult to study. In the early 1470-х years, he created two" Благовещения" maybe it was a picture for the altar. One of them is in the Uffizi gallery, one of the earliest works. It can be seen some similarities with the work of Lorenzo di credi, who was also a student of Verrocchio. early works include and pen drawing, which shows a river valley and afar picturesque cliffs. To this time belong the drawings of war machines, machines for the growing textile industry. 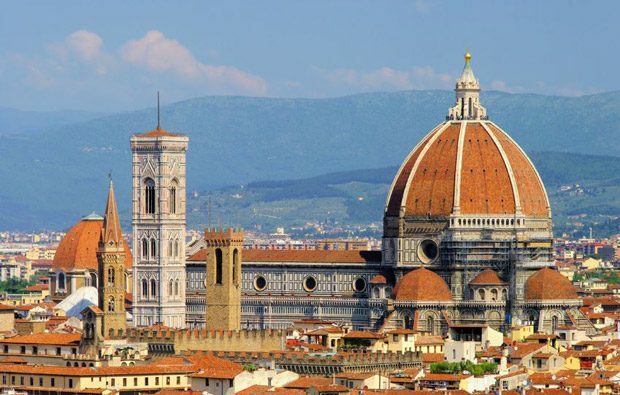 It is possible that these projects were commissioned by Lorenzo de Medici. the First large order received from Piero Pollaiolo, — altar of the chapel of St. Bernard. Leonardo received an advance, but the work was not finished and went to Milan. Another order – altarpiece" Поклонение of the Magi". But this work, having received an advance, the artist has not completed. This work critics consider the Foundation of European painting. 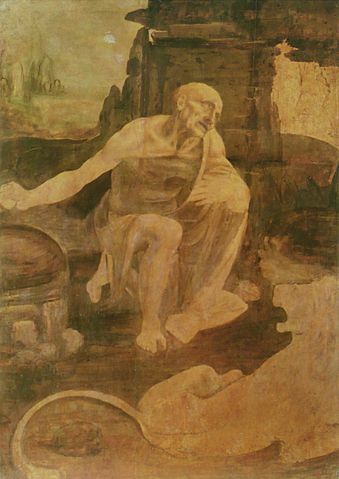 Sketches for this work are in the Uffizi, the Louvre and the Museum of Britain. This song was finished by Filippino Lippi. Picture" Святой Jerome" also neokoncheno. The figure of the Saint is depicted with a great knowledge of anatomy. Lion in the foreground is indicated by a contour line. work 1478 — 1480 years are:" Портрет of Ginevra" and" Мадонна with flower" (located in the exposition of the Hermitage). 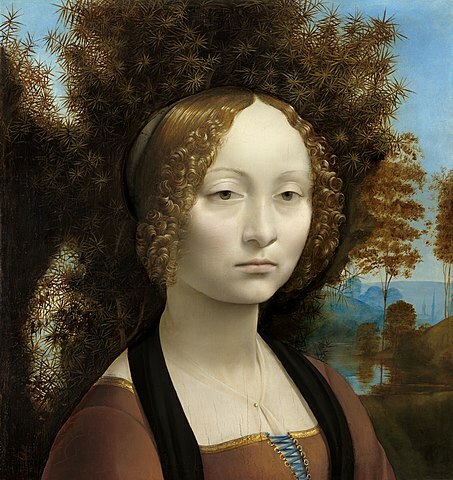 Serious appearance of Ginevra gives reason to believe that the first psychological portrait in art.
" Мадонна Benoit", perhaps written on the sketches, which are now kept in the Museum of London. Product performance in new technology and is characterized by a transparency of light and shade and luxury shades in restraint overall colouring. the Image of the air space blurs the boundary of objects and it connects the whole composition. Many critics suggest that" Мадонна with cloves" was created before" Мадонна Бенуа". As is known from historical sources, in his youth, Leonardo molded clay" головы, laughing girls" and then they did the casting. He drew a monster on a shield of wood." Оно was disgusting. It seemed that his breath poisons and inflames all вокруг". 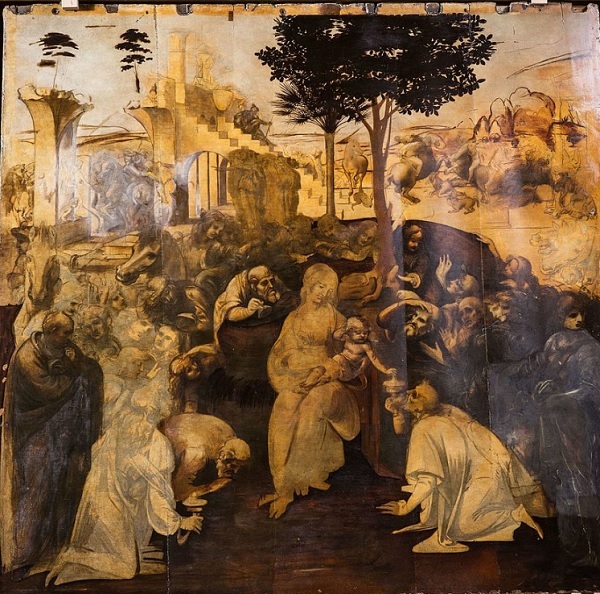 In 1482 he went to Milan and brought the two unfinished paintings. One of them" Мадонна litt". He finished it in 1490 In Milan, his work was diverse. He worked as an engineer and mention it along with the D. Bramante. Drawings of this period — proof of the genius of the genius of this great man. He was actively involved in the construction of the canal and significantly improved the system of locks. Da Vinci intensively worked on the project of the ideal city. In his view it was a three-tiered city. In 1487 he presented the project of the dome of Milan Cathedral. The Commission could not make a final decision and postponed the contest for the summer of 1490. But the master refused to participate. Da Vinci designed the wedding celebrations of the rulers, was a musician and a brilliant conversationalist. Wrote fables and riddles. In Milan, he became friends with F. Cardano (physician and mathematician). Often visited John. Marliani. Da Vinci carefully studied and observed nature, but never sought to copy it. He wanted to create what-то new. So he wrote" Голову jellyfish". It was not over, but adorned the collection of Duke Cosimo de " Medici.
" Атлантическом code", the master records of different areas of knowledge, there is a draft of a letter to Lodovico Sforza. He offers his services as an engineer and sculptor. He says he wants to create a large monument to Francesco Sforza. his Circle of friends included: George"s mathematics Score and the theologian Pietro Monti. In 1496 Leonardo attended lectures of the famous mathematician Luca Pacioli. It was an extraordinarily gifted man. Leonardo da Vinci left this world on may 2, 1519. He left behind a lot of ideas, great pictures and even more unsolvable mysteries.